Does the thought of expensive Halloween tricks and treats send shivers down your spine? Fear not! Here are four devilishly easy decorations and snacks you can whip up for next to nothing. Best part: Hearing your kids shriek with excitement. 6 cups of popped popcorn (or candy corn). 1) For each mummy hand treat bag, place one of the vinyl gloves on your left hand (or right if you’re left handed) and glue on strips of gauze. Remove and let dry. 2) Using the permanent marker, draw on finger nails. 3) Fill with popcorn or candy corn and watch your kids scream as they fill up! 1. 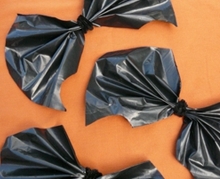 Lay the bag out flat on a floor or table. 3. For each bat, take one of the rectangles, lengthwise, and fold a one-inch flap. Flip it over and repeat until you have folded the entire piece into an accordion. 4. 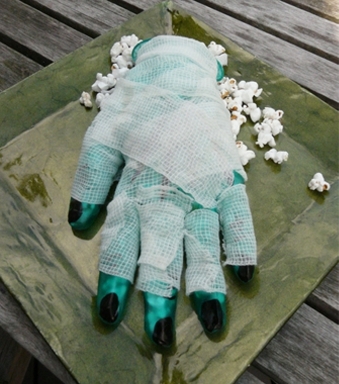 Pinch at the center and wrap with a black pipe cleaner (or bag tie) to create the body. 5. Using scissors snip the top corners of each wing to create a sharp angle. Then, on each bottom wing, cut a semi circle to create a scalloped edge. 6. Using the end of the pipe cleaners or bag ties, clip the bats to curtains, lampshades, or a long string to create your own ghoulish garland. 1. To create each spider’s body, blow up a balloon so that it is about 4 inches in diameter and secure with a knot. 2. Take 8 black pipe cleaners and wrap the ends once or twice around the end of the balloon (where you’ve just made the knot). 3. Cut both feet off the pair of old black tights, so they are about 8 to 10 inches long. 4. Place a balloon in each stocking foot, with the pipe cleaner ends sticking out. 5. Pull the tights back over the pipe cleaners and tie into two knots (the same place you attached the pipe cleaners to the balloon). Do the same for each balloon. 6. Cut the remaining ends of the tights and tuck into the knot. 7. 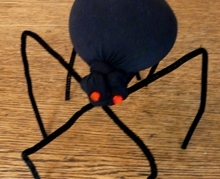 Take the pipe cleaners and bend them under each balloon to form the spider legs. 8. Glue 2 red pompoms on each knot (or spider head) to create the eyes. Now place them on a table or mantel and watch them bob. (Note: You may have to cut the ends of the pipe cleaners so that all are even in length). 1. For each eyeball, push one marshmallow, flat side facing out, onto the end of a skewer or lollipop stick and set on a sheet of wax paper or foil. 2. Drizzle red decorating icing over the marshmallows to create a bloodshot effect. 3. Place a green or blue M&M (logo facing down) at the center of each pop and top with a drop of black decorating icing to form the pupil.